Join Terhune Orchards and other wineries across the state as we celebrate Mom on this special weekend with free wine tastings for moms. What more wonderful way to treat your mom than with an afternoon of wine tasting! We will have special samplings from our own bakery. The whole family is welcome at Terhune Orchards. 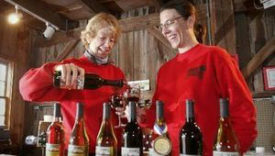 After wine tasting, visit the barnyard and farm store. On Sunday, enjoy live music by Kingston Ridge from 1-4pm. 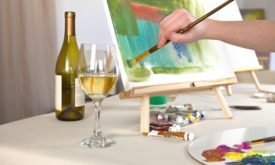 Create a pair of beautiful hand-painted wine glasses while enjoying Terhune's own wine. Pre-registration requested. Click here for tickets! Join Terhune Orchards as we celebrate Dad on this special weekend with free wine tastings for fathers. What more wonderful way to treat your dad than with an afternoon of wine tasting! The whole family is welcome at Terhune Orchards. 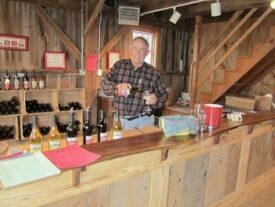 After wine tasting, visit the barnyard and farm store. Join us weekends in August in the Terhune Orchards Vineyard & Winery Tasting Room for Sangria Weekends. 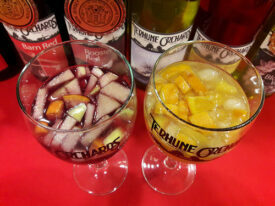 Cool off with a taste or a glass of our red sangria featuring our Chambourcin wine and our own apples or our white sangria made with our Vidal Blanc and Terhune Orchards’ just-picked peaches. 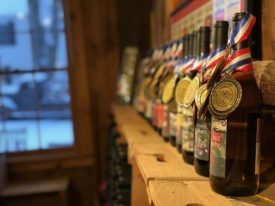 While you are here, sample our other award-winning wines, enjoy a glass while admiring local art in our 100 year old barn, or take home a bottle.